This week was quite a week. Monday the weather started picking up a lot: wind and rain, and lots of it! We had to get out in it to run to CVS and pick up Jim's medicine, and that was scary. It was a quick trip, though, so we weren't gone long. When we got back, we were staying put for a while. The wind and rain continued to pick up and blow pretty hard, but I know it was nothing compared to what happened in New York and New Jersey. Wednesday was Halloween, and it was a lot of fun. 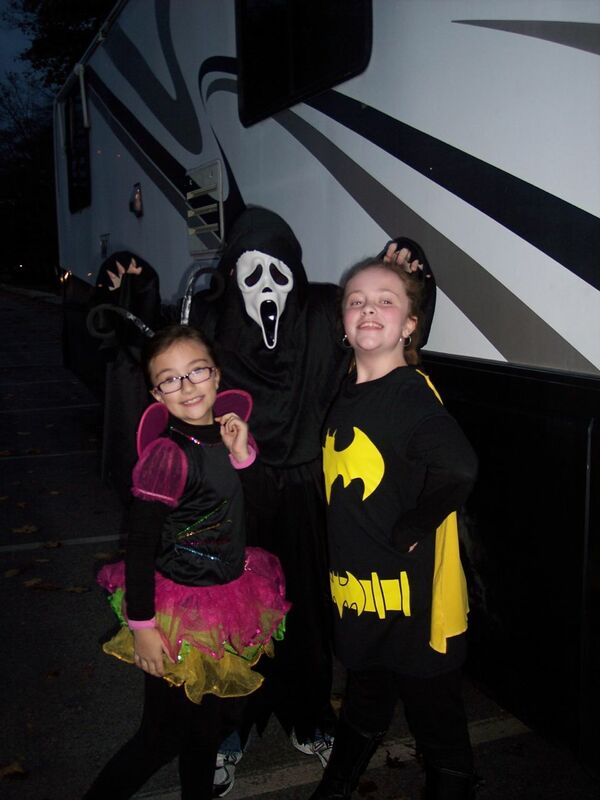 Chrissy was dressed as a rainbow bug, Rachael was Bat Girl, and Michael was the character from 'Scream.' 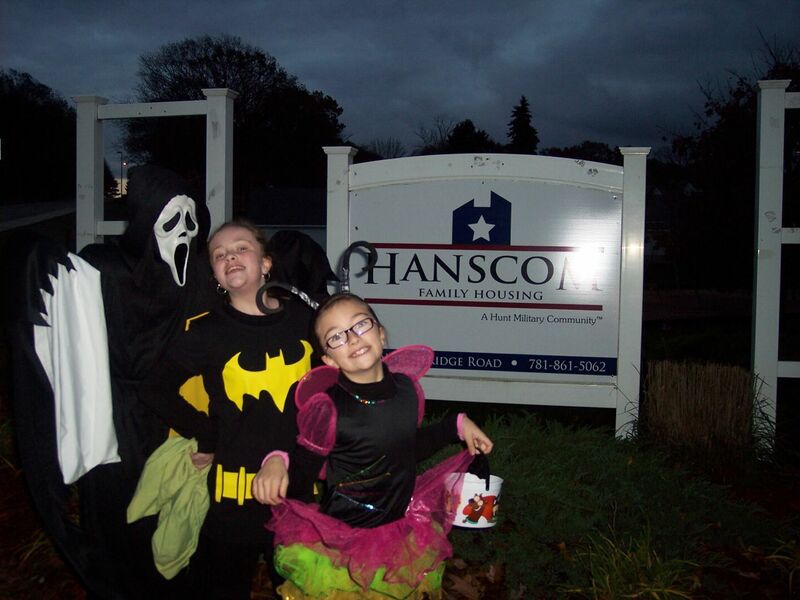 We headed over to the base housing area on the Air Force base to go Trick-or-Treating. There were easily 250 - 300 houses in the neighborhood. Of course we couldn't hit them all, but we sure had fun trying! The kids each got enough candy to fill up half a brown paper bag. It was a great night - we are so glad we decided to stay! 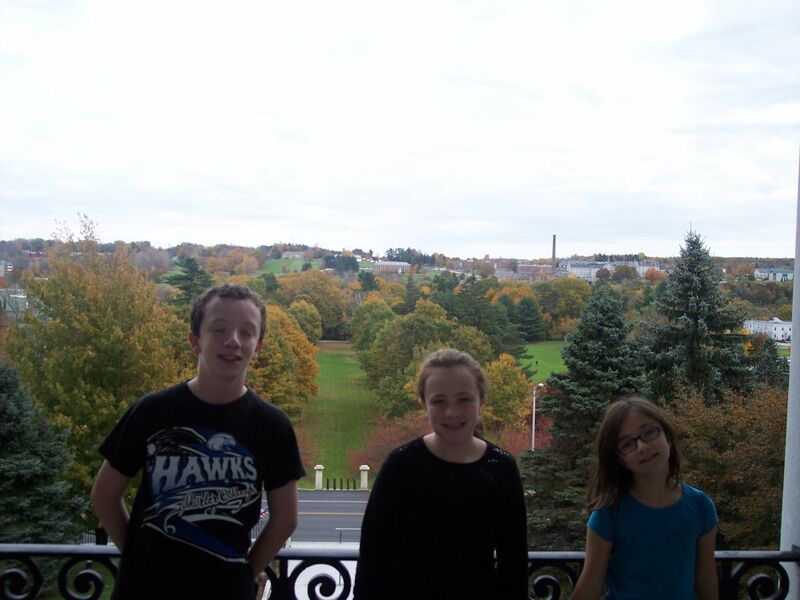 Today is Thursday, and we spent most of the day finishing up school work and getting ready to leave Boston. 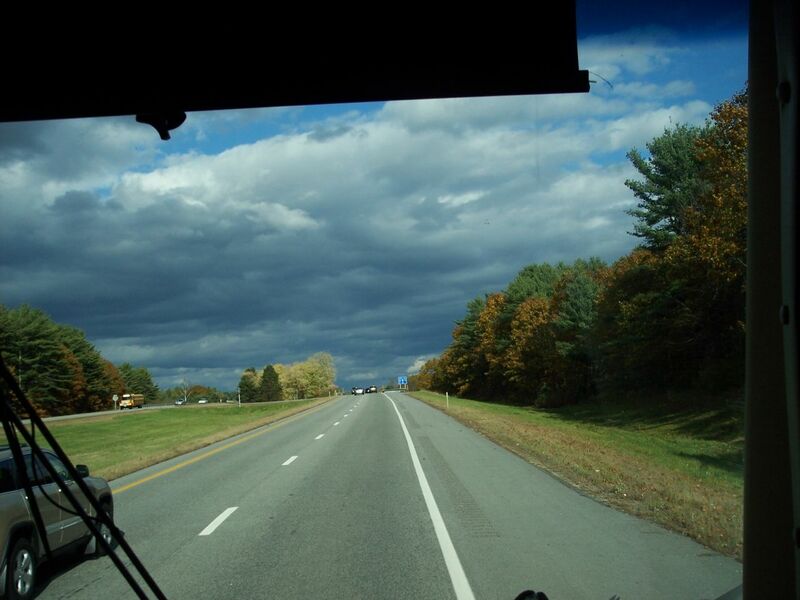 Tomorrow we will zip through the capitols in Rhode Island and Connecticut and head on into Delaware. Today we started out with a church service on base at Hanscom Chapel. Their Protestant church service was at 9 AM and was followed by a time of fellowship. We enjoyed the service and met some very nice people. 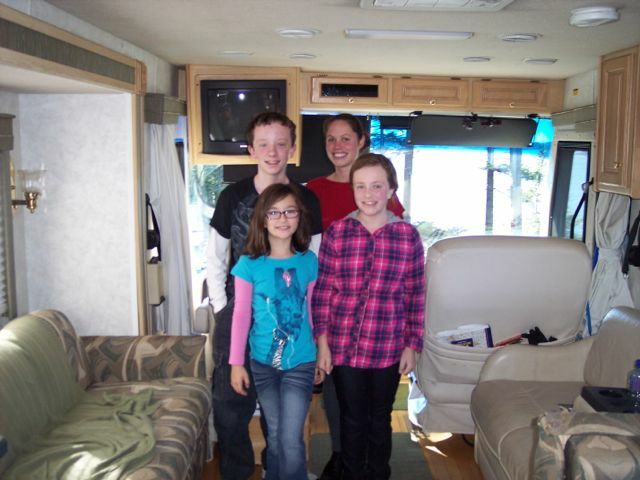 Several families also homeschool their children and we had good conversations about that as well. 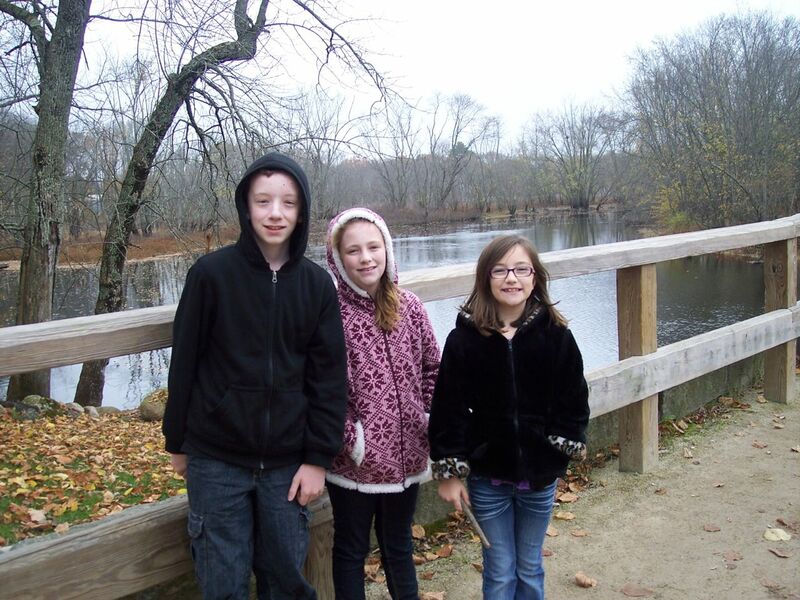 After church, we went back to the Minuteman National Historical Park, but this time we went to the part in Concord where the North Bridge is located. The North Bridge was the site where the first shot of the Revolution was ordered - otherwise known as "the shot heard 'round the world". 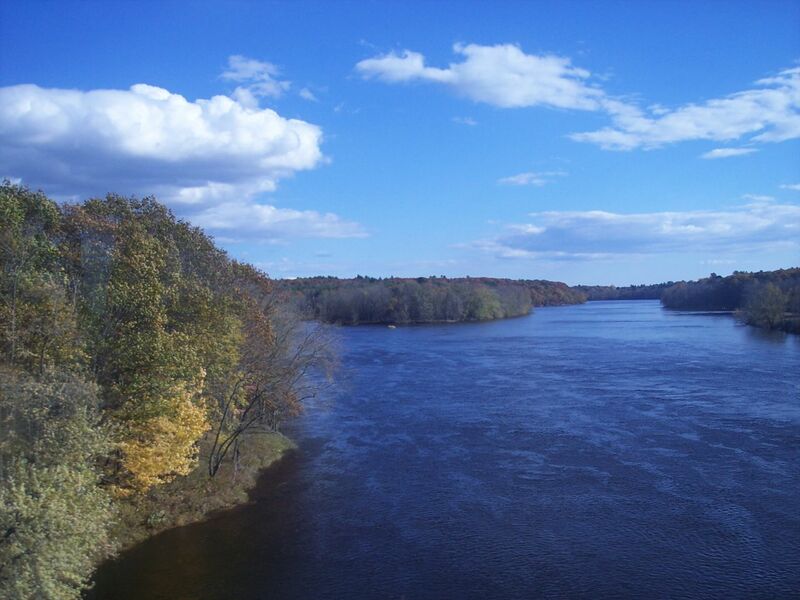 The American minutemen met the British army on the North Bridge and began this first battle. We heard details of the battle during a Park Ranger talk. When we finished at the park, we headed to the commissary to stock up on food and water. Hurricane Sandy is headed to the New England area, and while Boston should be spared a direct hit, we want to be prepared. We aren't sure what conditions will be like. After the commissary, we had to return the rental car. We did that and settled in for the night. We aren't sure what the rest of this week will hold, so we are planning on remaining in Boston until probably Thursday or Friday. 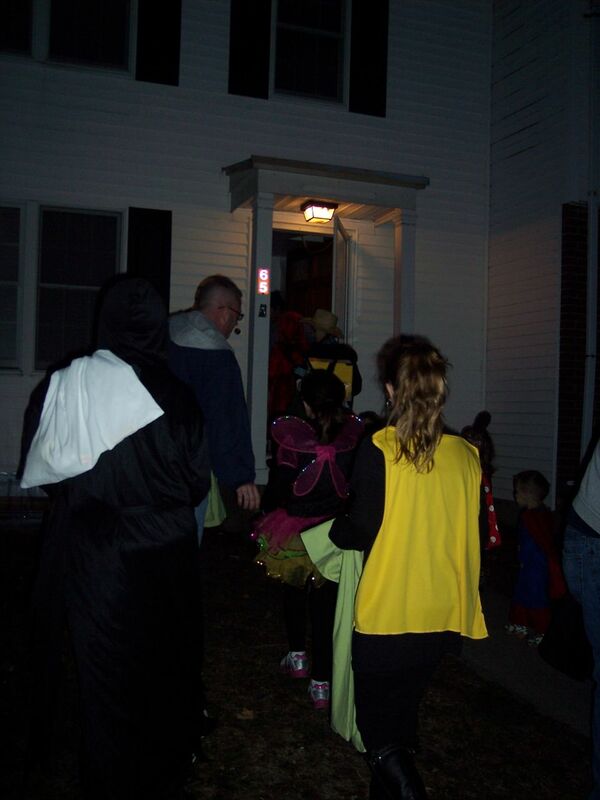 Wednesday is Halloween, so the base housing is the perfect place to take the kids Trick-or-Treating. Should be an interesting week. 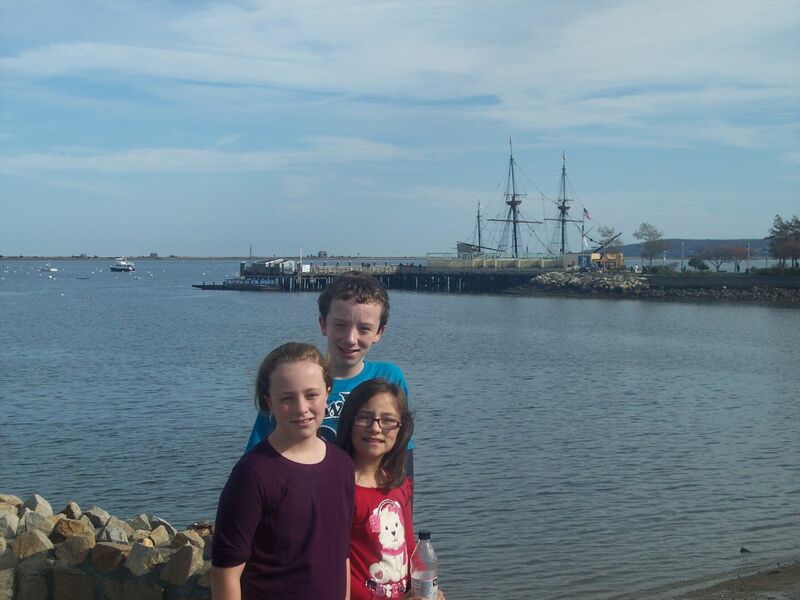 This morning we drove about an hour down to Plymouth, MA, to see how the Pilgrims lived back in the 1600s. Plymouth is a cute little town with lots of tourist attractions related to the Pilgrims. 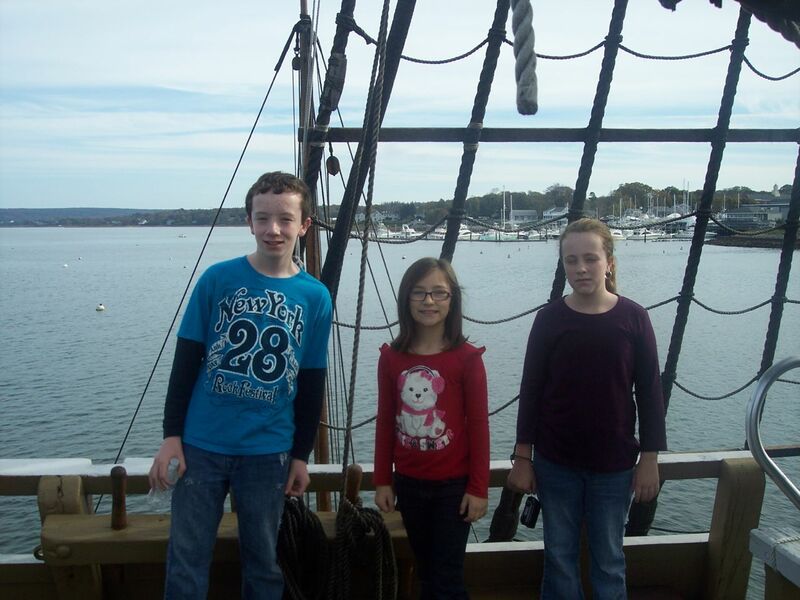 The first thing we did was tour the Mayflower II. This ship is a reproduction of a ship like the Pilgrims would have used in 1620. It was hand crafted in England in the 1950s and crossed the Atlantic under its own sail power. There are 'crew' members aboard that share all kinds of knowledge about the ship and the passengers. There were also 'cast' members; these people were dressed like Pilgrims or crew from the 1600s and totally played the part. They were happy to answer any questions from their viewpoint. We asked to take a picture and their response was that they didn't know what that was and would it hurt. It is unbelievable that 102 Pilgrims, plus the ship's crew, fit on a boat of that size. There really wasn't that much room. Plus, when you factor in having to use chamber pots and that there were three pregnant women on board....yikes! This is a perfect example of what our trips are all about. 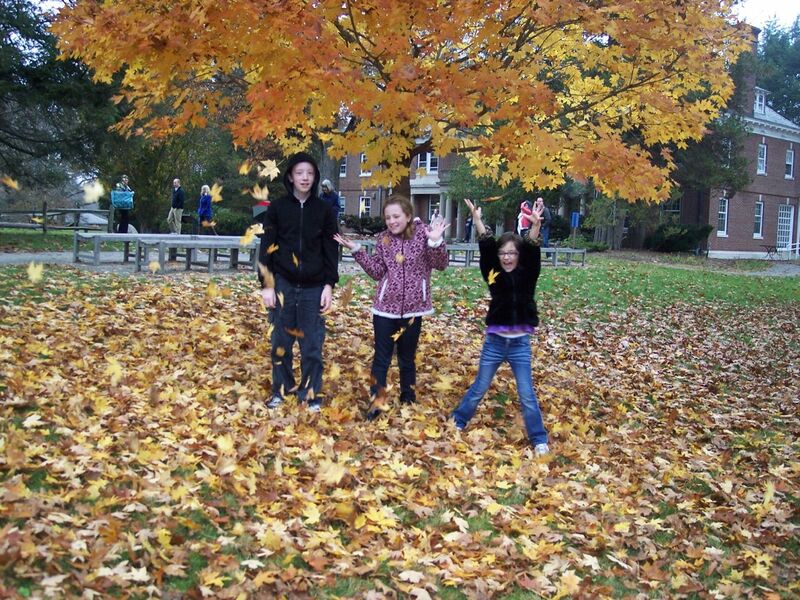 What the kids learned about the Pilgrims and their travels can't really be learned in a book. We don't think they will ever look at Thanksgiving and the Pilgrims in the same way again. After the boat tour, we walked the few blocks to see the actual Plymouth Rock. 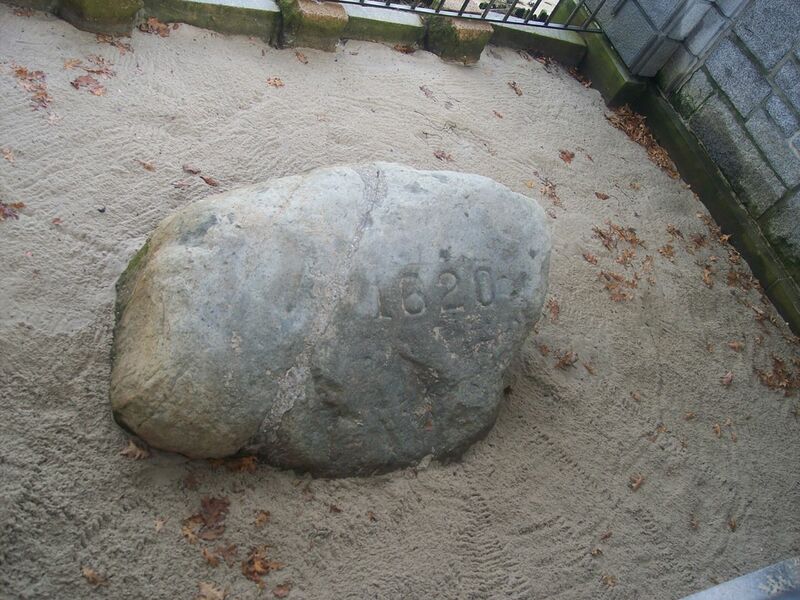 There is a long story about how people came to believe that this was the actual rock where the Pilgrims set foot on land, but I truly can't remember the details. However, more information can be found HERE. Anyway, there is a very nice portico built over the rock, which is etched with the year 1620, the year the Pilgrims landed. There was a state park ranger that gave a little ten minute talk about the rock and the Pilgrims. The rock is in the smallest state park in the state of Massachusetts. Pretty neat, even if it wasn't as impressive as some might imagine. After the rock, we went to the Pilgrim Hall Museum. This museum chronicles the life of the Pilgrims in the new world, as well as housing some artifacts from the actual Pilgrims themselves. We were curious as to how the items were preserved for so long before they wound up in the museum. The docent said that most of them had been passed down through the families for generations. We have a friend that is an ancestor of one of the original Pilgrims, Peter Brown. 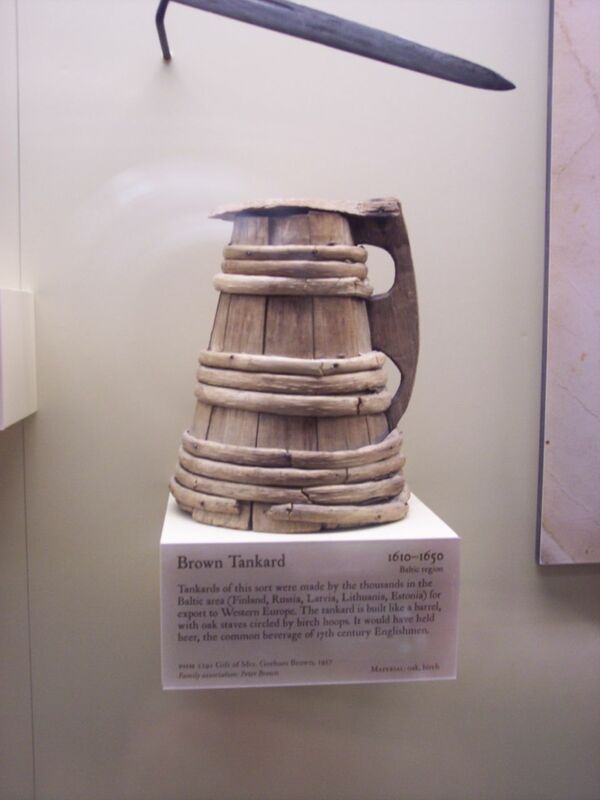 The museum had a tankard, basically a mug, that belonged to Brown, and I was able to sneak a picture of it - with no flash! - for our friend. 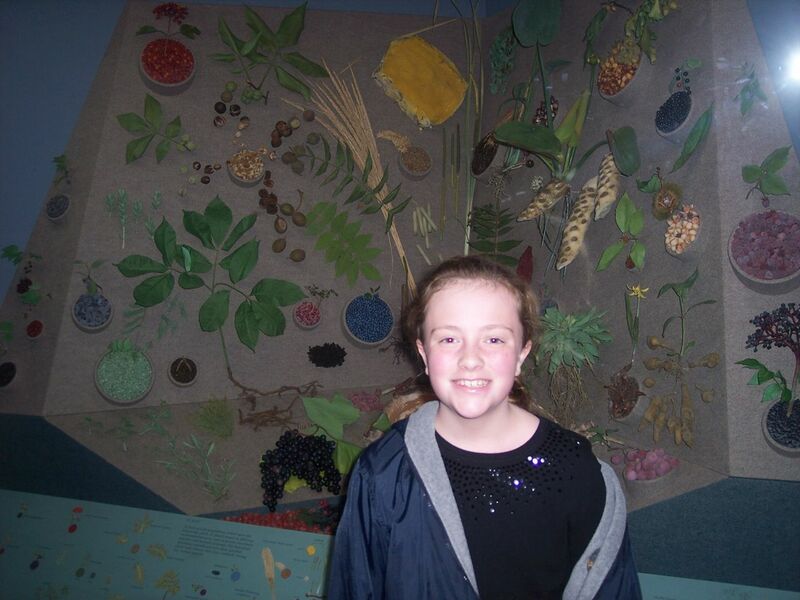 The museum also had a neat scavenger hunt in it, with different hunts for different ages. The kids always like doing those, and it gets them a little more involved in the museum, plus it really got them thinking about not only the trip across the Atlantic, but also about that first, harsh winter. By the time we finished at the museum, it was time for dinner. 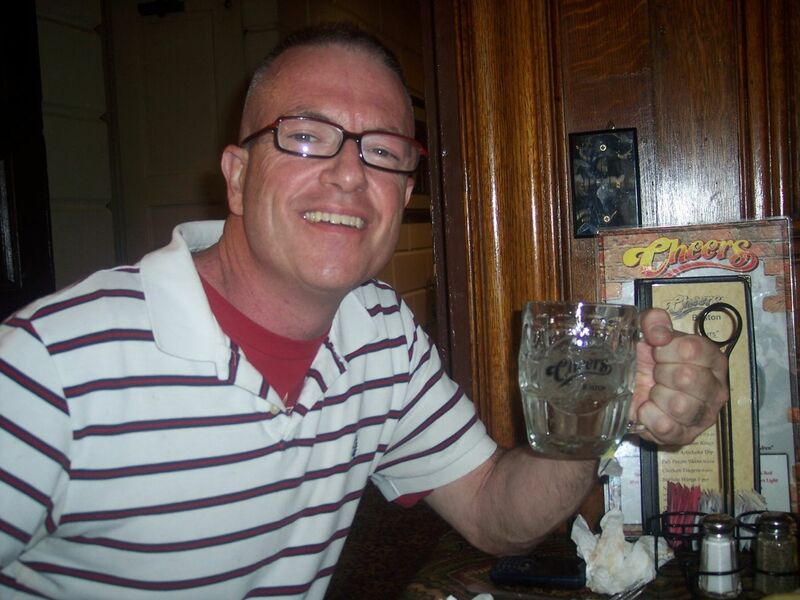 We have another friend, that's from Massachusetts, and recommended a restaurant in Plymouth for us to try. 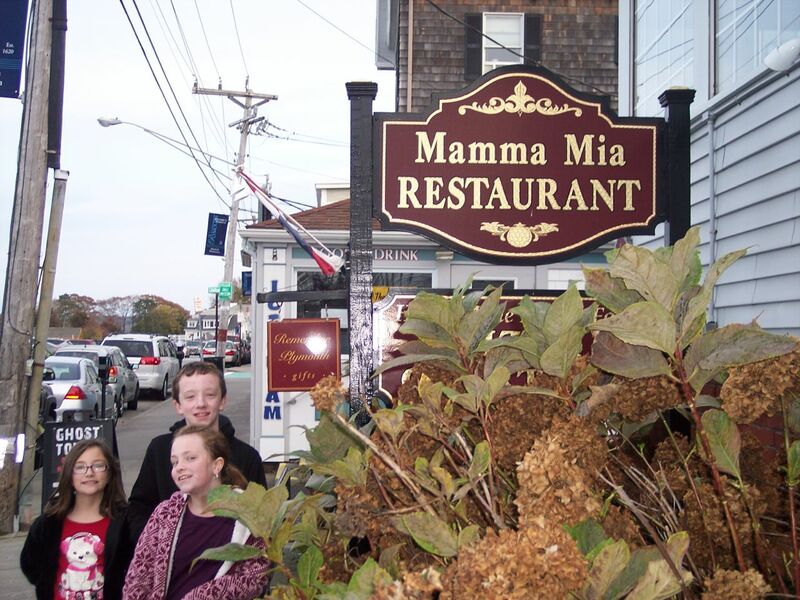 It is called Mamma Mia's and they serve pizza, so it was a go for us. We all had different things, and it was all really good. 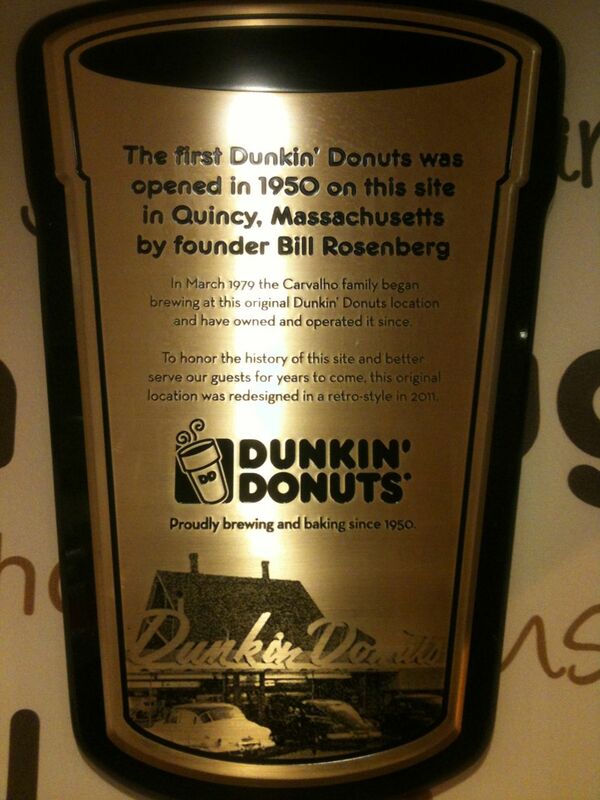 On the way back to Boston and the RV, we stopped in Quincy, MA, at the very first Dunkin Donuts. It was remodeled last year to look like it did originally in 1950. We enjoyed our donuts and hot chocolate. 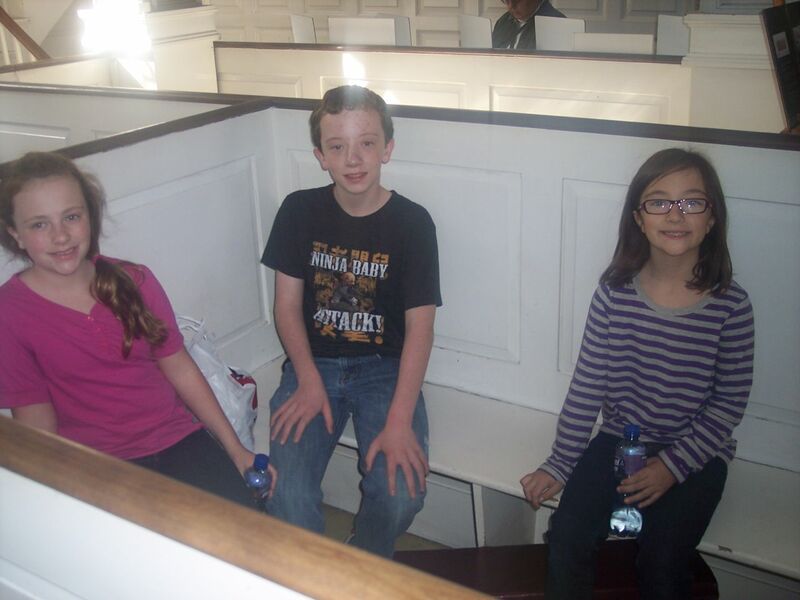 Tomorrow is church and more touring historical sites around Lexington and Concord. More picture in the Photo Gallery. Today we drove into Boston in the rental car. Some people had advised us to park at a train station and ride the train into the city, but someone else suggested we park at the Coast Guard station down there and walk around. So that's the option we went with. We pulled into the gate with our ID cards, and the guard promptly kept mine. Apparently, mine had expired a few months ago and the guards are required to keep any expired cards. This was an inconvenience, not a problem. They had an ID card office there so we went in and got a new one for me. Once that was taken car of, we headed into the city. 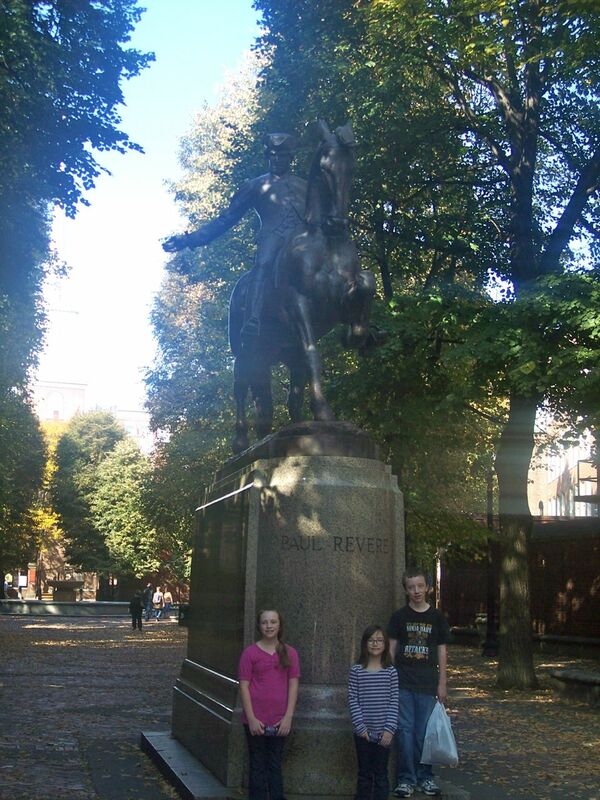 Our first stop was at a statue of Paul Revere, the statesman who is famous for his "Midnight Ride" during the beginning of the American Revolution. Adjacent to this park was the Old North Church. This is the church where the lanterns were hung that alerted the countryside that the British soldiers were on the way. The church is still an active Presbyterian church. Instead of pews, there are family boxes. Back in the early days of the church, families had to purchase their boxes. From the church, we followed The Freedom Trail through the city to other historic sights. The Freedom Trail is a 2.5 mile brick trail throughout the city that connects to sixteen historic sights, from graveyards to meeting houses. 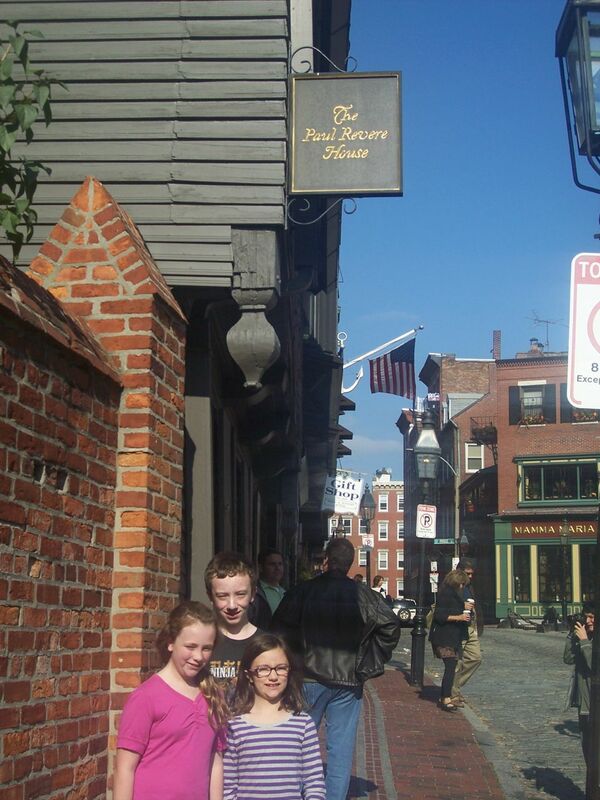 We stopped briefly at Paul Revere's house, where his famous ride began. We continued on towards the current State House (Capitol). 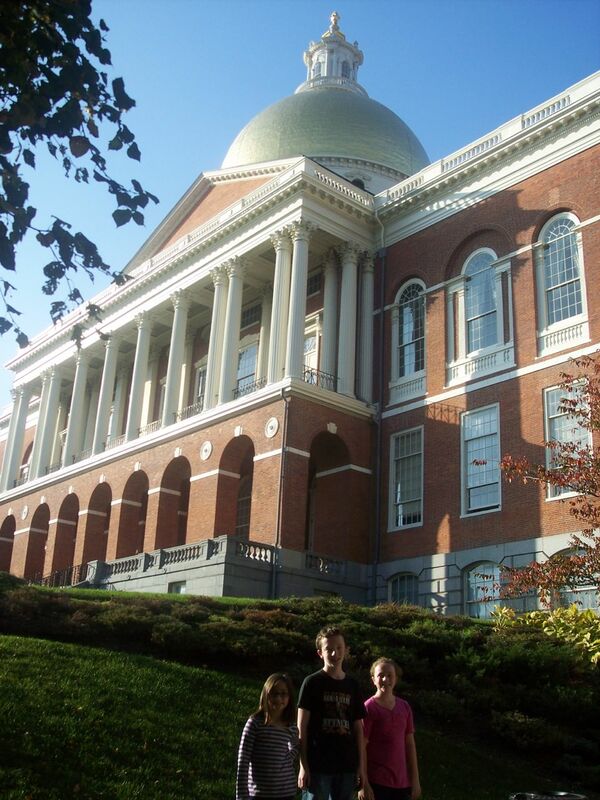 The Massachusetts State House is a beautiful building with a gold dome. We had time, and were on time, for a tour. The tour started in the Hall of Nurses, which honors all nurses. The Hall of Flags used to be an open courtyard area, but in 1990 it was enclosed by the governor's wife to have a meeting space/reception hall for the governor's use since there isn't a governor's mansion. There were beautiful stained glass windows throughout. 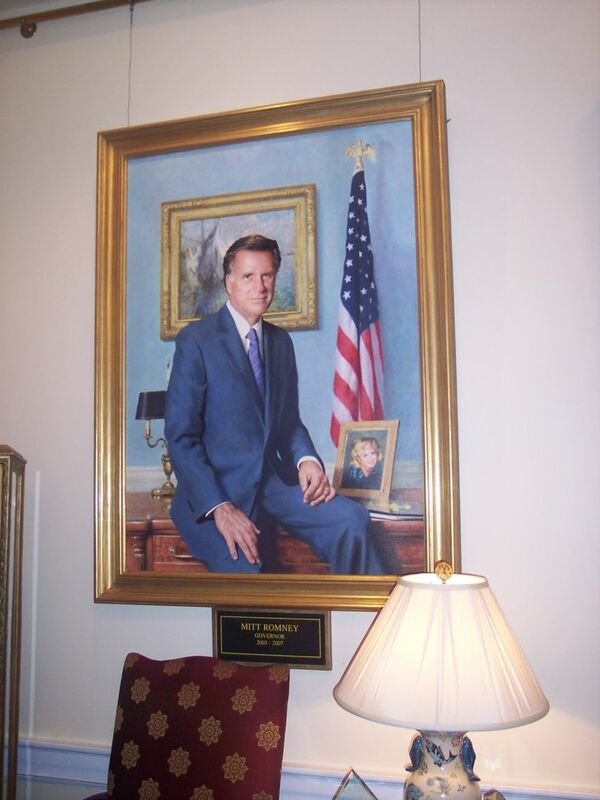 One interesting thing in the House of Representatives was the 'Lucky Cod.' 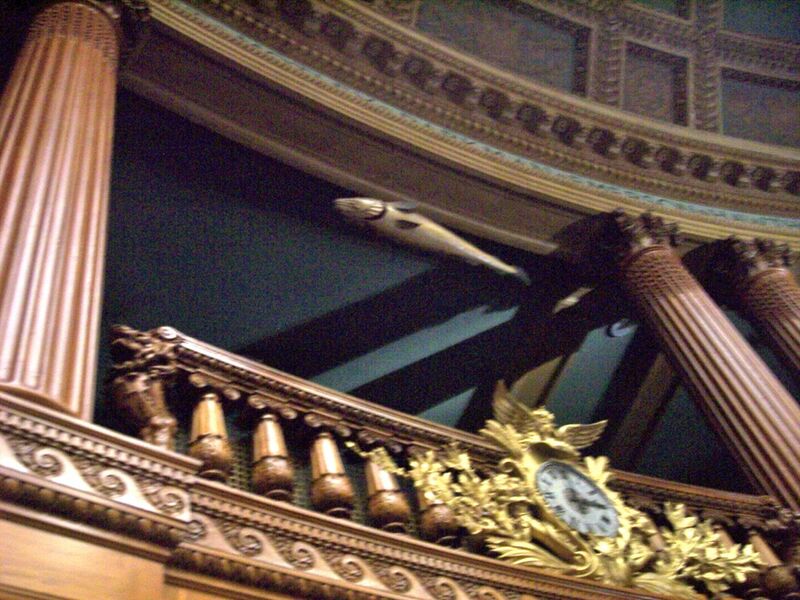 The lucky cod hangs in the balcony of the House Chamber. It has been tradition for the house to not meet unless the cod was there. In the 1930s, some Harvard students took the cod. When it was later discovered that Harvard students had taken it, the dean threatened whoever was responsible with expulsion. Miraculously, overnight, the cod appeared on the front lawn of the police department. It's been there ever since. When we finished at the capitol, we walked a few blocks down to the bar where the idea for the TV show "Cheers" was born. There are two parts to the bar. All of the outside shots for the show were filmed outside of the downstairs part. Inside here is a bar. It was smaller than we expected. Upstairs was a duplicate of the set used on the show, just on a smaller scale. Since they had seating apart from the bar area, we decided to eat dinner hear. It was something unique to Boston! The food was fabulous and very reasonable. 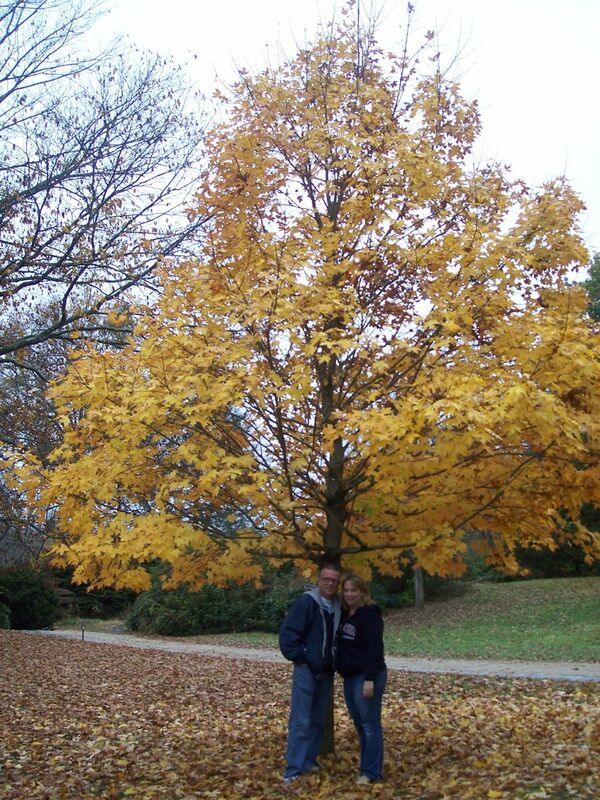 We took pictures around the place before we left. After dinner, we started back towards where we parked. In the Little Italy section, near some of the historic sights, there is a place called Mike's Pastry. 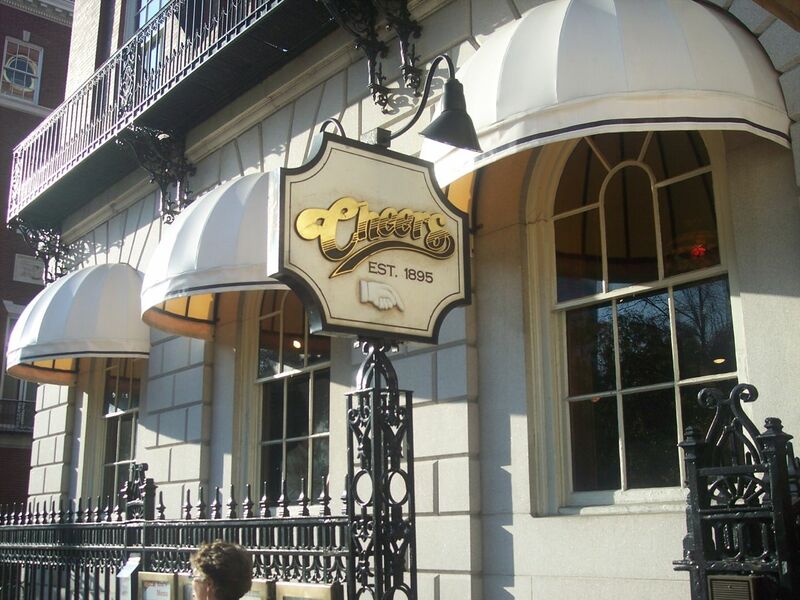 They are famous in Boston for their cannolis. They come in a bunch of different flavors, from creme filled to chocolate covered, which is what we got. They were huge! We all shared the first one and saved the second one for later. After we got back to the car, we decided we still had enough time to go to the Museum of Science since it was open until 9 PM. This place was so big... we had about an hour and a half, and we only got to see one wing. There were at least two others we didn't get to see. We might try to get back by there before we leave Boston, but a lot depends on the approaching hurricane, "Sandy." Today we finished our drive to Boston. 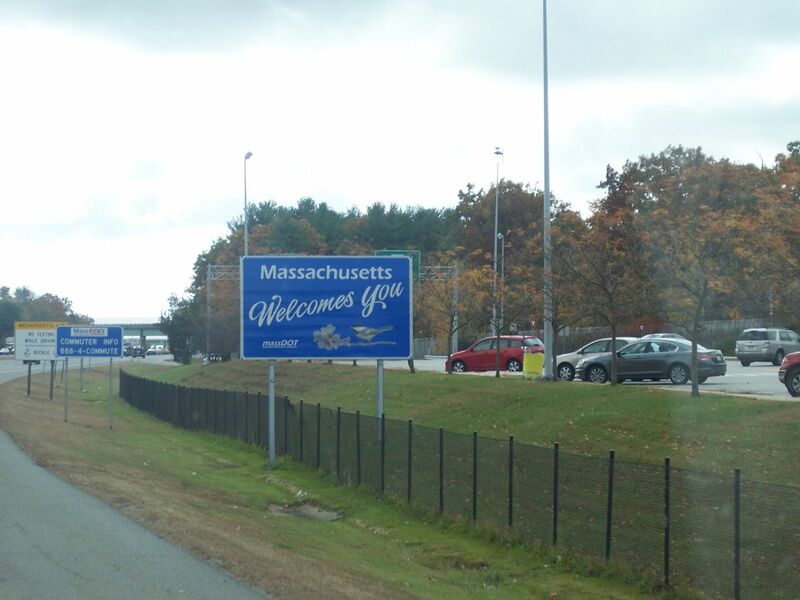 We passed through New Hampshire and into Massachusetts. We are staying at the campground at Hanscom Air Force Base. 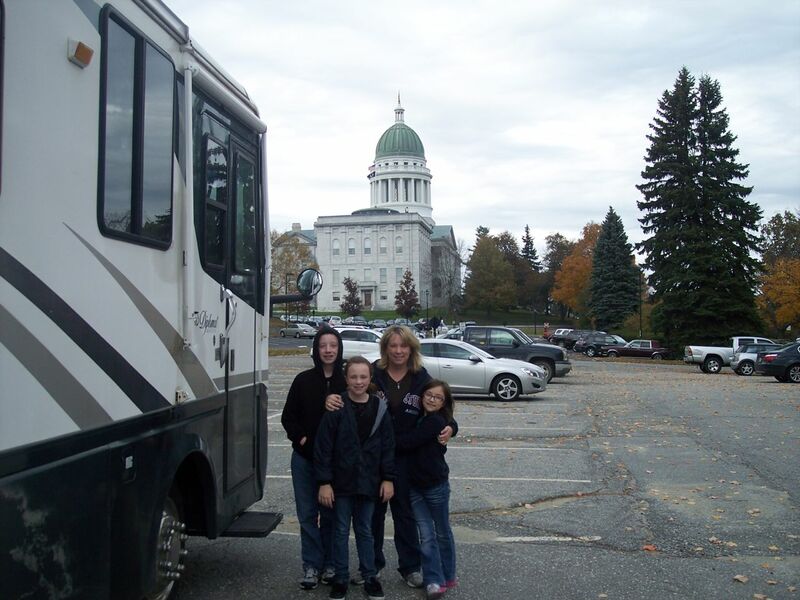 Once we got settled in and picked up a rental car (I would NOT drive the RV into Boston! 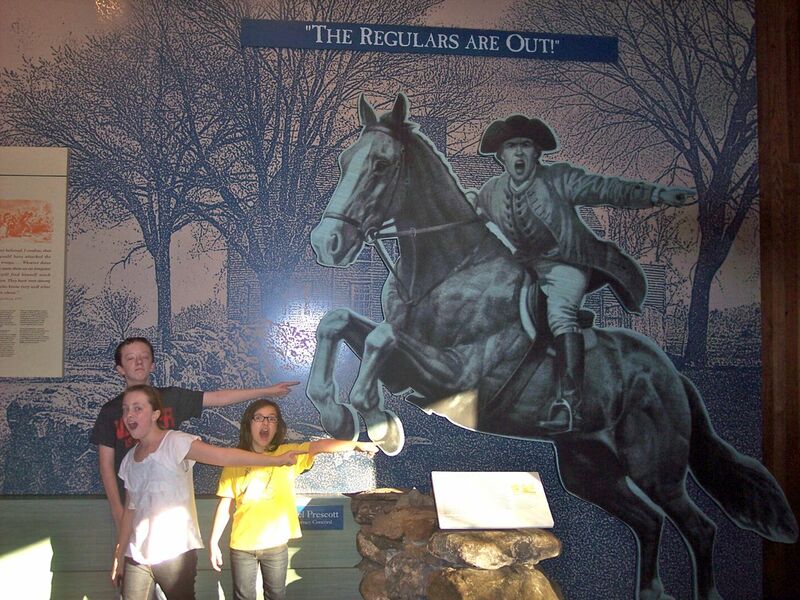 ), we had just enough time to go over to the Minuteman National Historical Park. 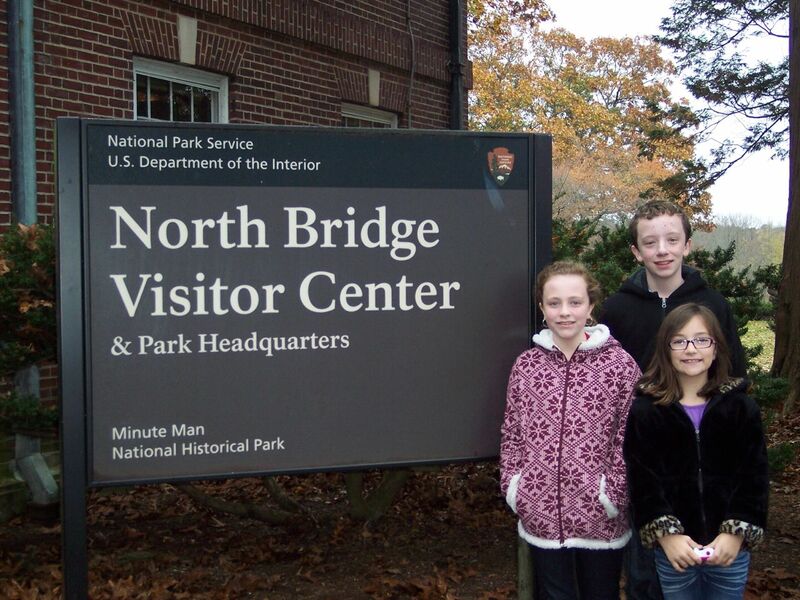 This historical park lies along the path where the first battles of the American Revolution took place, starting near the Old North Bridge and running between Concord and Lexington. This visitor's center provided us with a lot of information on the beginning of the Revolution. They had a short movie, as many visitor's centers do, about the area and its significance. The neat thing about this movie was that it was a multimedia show. There were several screens, a map that lit up, and replica of the Old North Church where the two lanterns were hung to signal 'two if by sea,' plus other features that are little more difficult to describe. Overall, it was if you were sitting in the tavern talking to the Patriots. It was really neat and very educational. It got a good discussion going with the kids about the Revolution and the people who had the courage to fight for liberty. 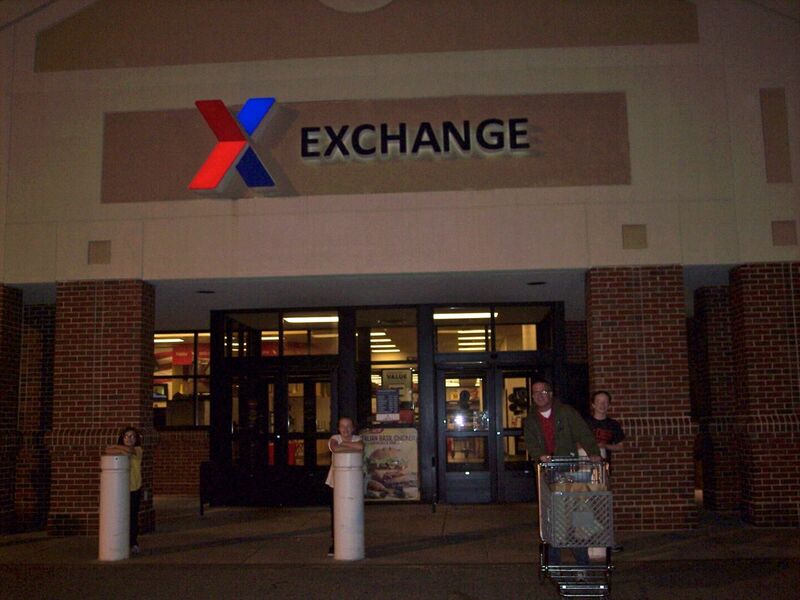 When we finished there, we had enough time to do a little bit of shopping at the military base exchange (shopping store) and the commissary (grocery store). The kids love to shop there, although I'm not sure why! Tomorrow we are going into Boston to check out all of the historical sights. Today we pulled out of Campobello Island. Before we did, though, Michael and Angela Calder came by to say goodbye. They and their family have been so wonderful to us...definitely a plus on this trip! We went over to the East Quoddy Lighthouse to see if the tide was low enough for us to make it over to it and look around. The tide was low and beach was exposed. However, there was a ton of seaweed on the rocks and we were concerned about someone slipping and falling, so we opted to not risk it. 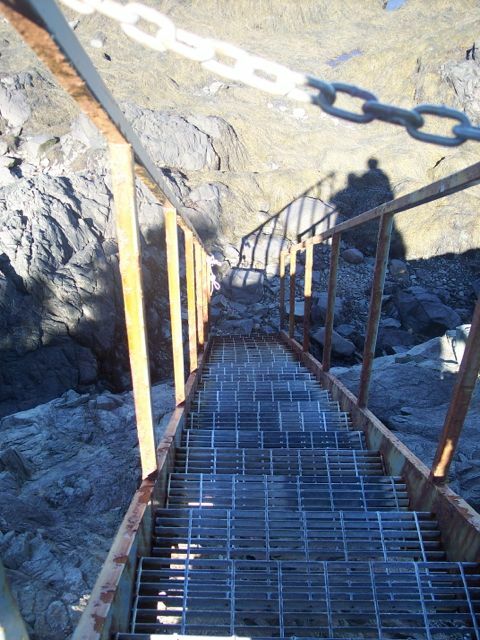 We did get a picture of the stairs while it looked like the lead somewhere! 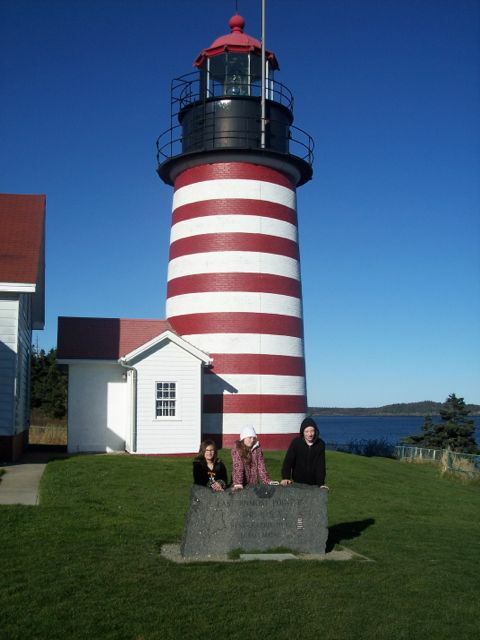 Once we made it through customs on the US side, we headed to the West Quoddy Lighthouse in Lubec, Maine. The lighthouse is a pretty red and white striped pattern. But the neatest part of this property is the geographical location. This lighthouse is the eastern-most point of the continental United States! There is a marker there, kind of like the one in Key West for the southern-most point. We knew there was a museum to visit, but it had already closed for the season, much like everything else in this area of the country. We looked out into the water and saw a whirlpool, which was pretty neat. We took videos and pictures of it. 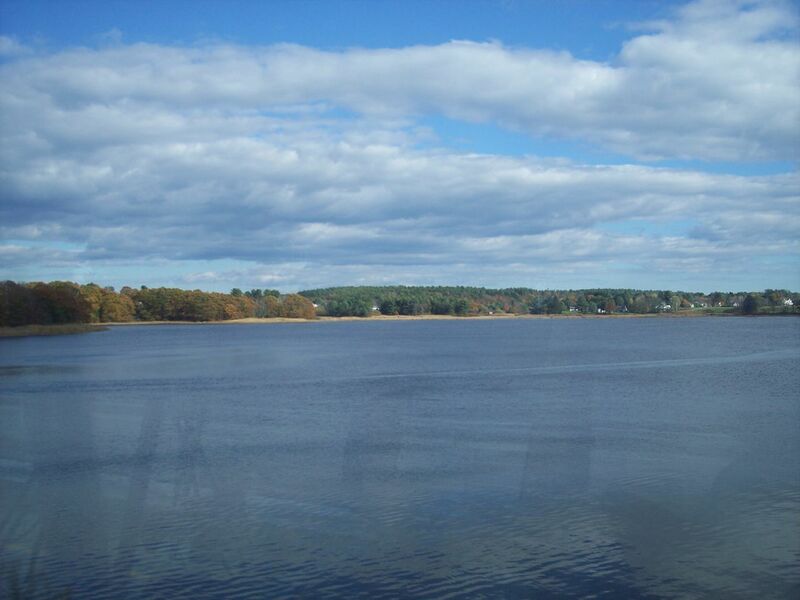 Since we had done all we could do there, we took some pictures and headed on our way towards Boston. Check out the pictures in the Photo Gallery! Today we started out doing a little bit of schoolwork. It's always there no matter where we go. Then we had an employee of the Roosevelt Campobello International Park, also Michael and Angela Calder's daughter-in-law, Jocelyn Calder, join us for a private "Tea with Eleanor." "Tea with Eleanor" is a program the park offers during the summer. You enjoy tea and scones while learning more about the woman that Eleanor Roosevelt was. Since the summer season ended last week, Jocelyn was more than happy to come and give us the presentation at the RV. She even brought tea and doughnuts for us! The presentation was very informative and gave you the picture of who Eleanor really was. 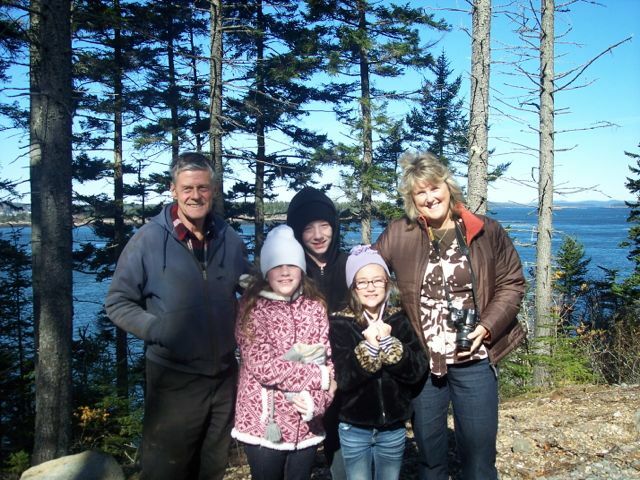 Jocelyn also shared a secret Campobello spot with us. There is a little cove where a freshwater stream meets with the salt water ocean. The mussels there often get bits of sand in there with the water moving back and forth and form tiny little pearls. Jocelyn offered to go with us to the cove and show us how to get the pearls out. 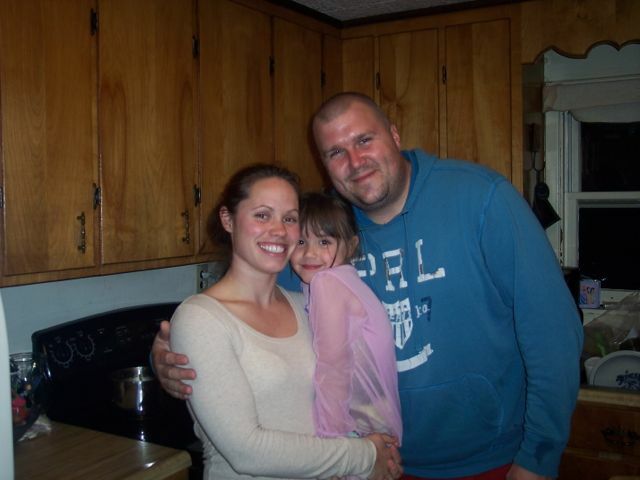 Jocelyn met us at the cove with her husband, Bob, and their daughter, Charlie. Poor Bob was dressed in shorts, a t-shirt, and flip-flops. 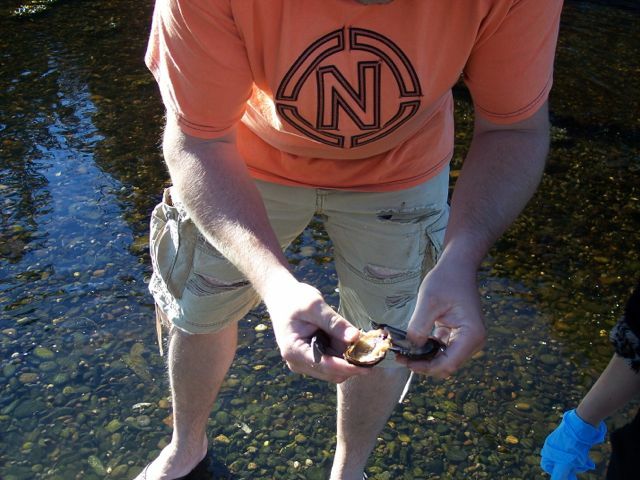 He said someone had to go in the water to get the mussels, so he might as well dress for the job. 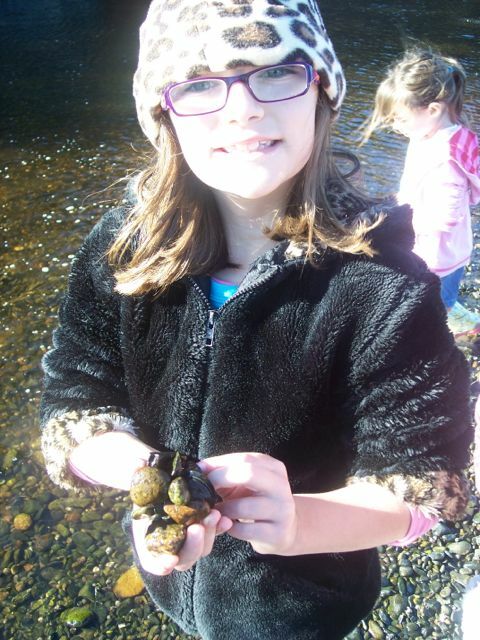 Thankfully the stream was only an inch or two deep, so the kids all helped out finding mussels. Once you pull them out of the water, you pry them open with a knife and search around through the mussel for the little pearls. The longer the grain of sand has been in the mussel, the larger the pearl. We had so much fun looking for pearls! They are all tiny and different colors, from deep purple to silver and white. Bob and Jocelyn so graciously invited us to dinner at their home, so we took them up on the offer. We had a few places to visit before dinner time, so we agreed to meet up with them later. 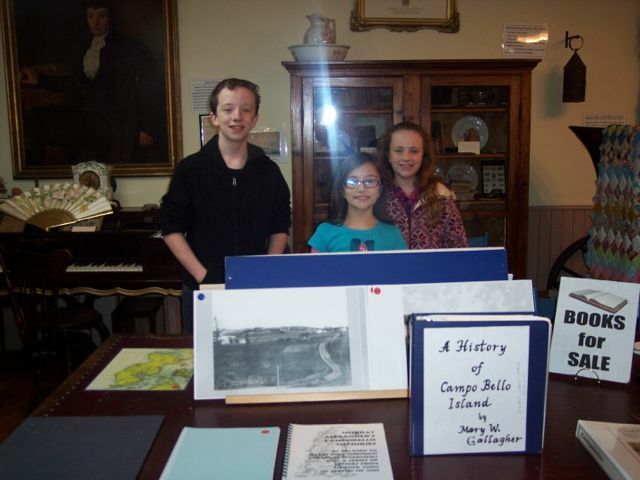 We headed off to the little local library that has a museum about Campobello. 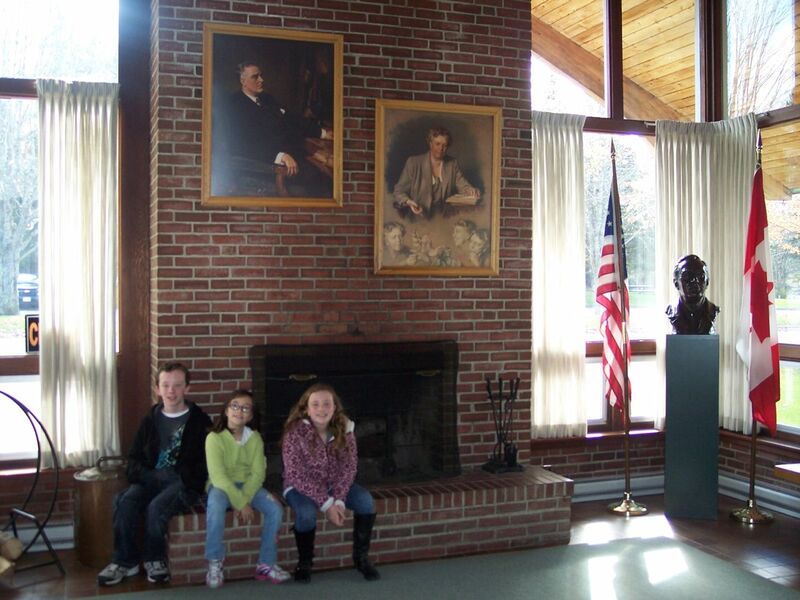 It had neat artifacts and photos from residents, as well as history about FDR. We didn't have a lot of time there, but it was enough to tour the facility. After the library, we headed to what is called Barrel Well. 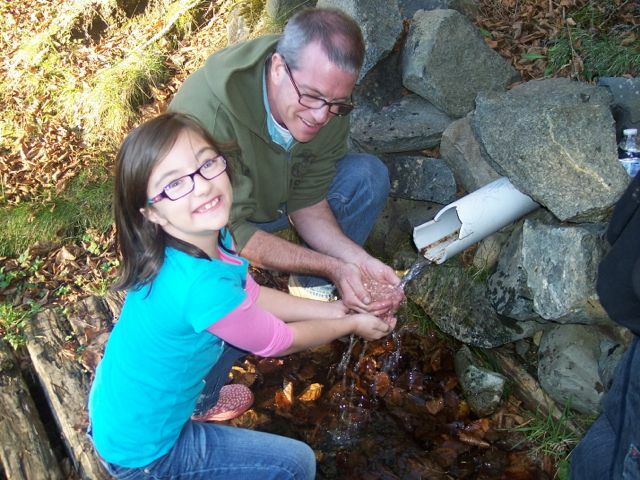 Tradition tells that the water has never stopped flowing from Barrel Well, and if you drink from it, you will return to Campobello Island. We had our drink, so time will tell if we return! 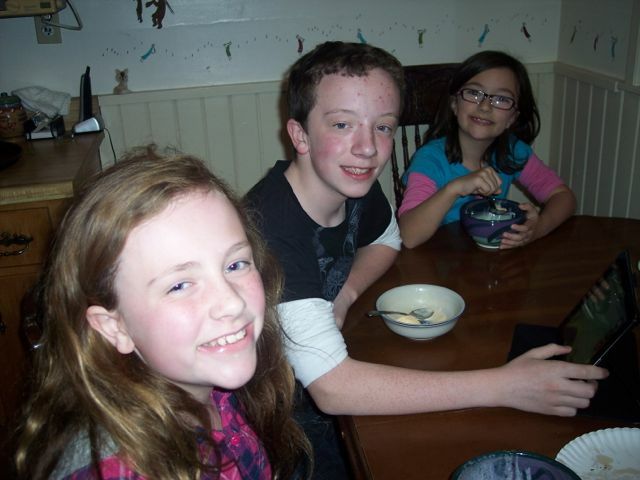 We went to Bob and Jocelyn's house for dinner. Bob made homemade pizza and Jocelyn made brownies to go with ice cream. We really enjoyed dinner and getting to know them better. They are wonderful people. Tomorrow we are actually going to try and leave this beautiful place. We'll see if we make it out! Oh what a day! We woke up on the beautiful Campobello Island this morning with American Bald Eagles flying by! Our friend's lot sits on a cliff overlooking the water. 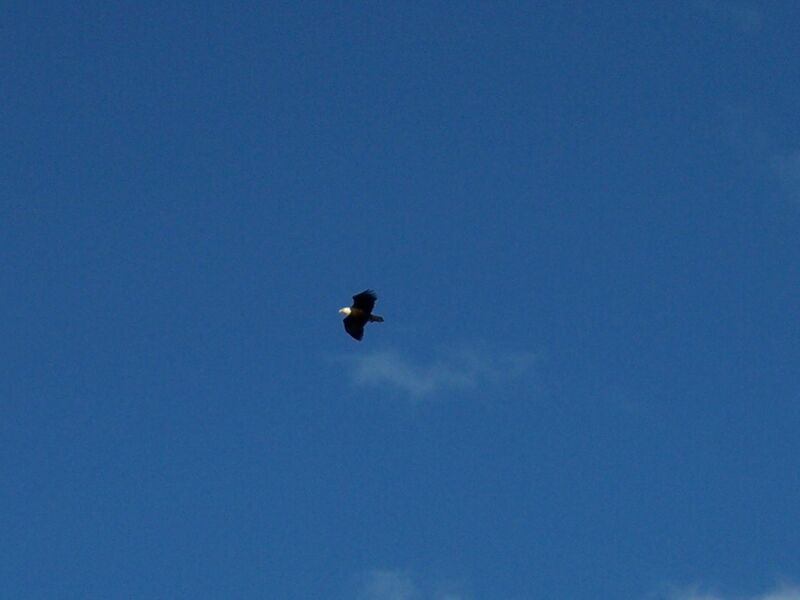 The eagles nest nearby and fly by throughout the day. During the summer, whale sightings are not uncommon, although I think it is too late in the year for us to catch a glimpse of them. Our friend has some friends here locally on the island. Their names are Michael and Angela Calder, and they graciously loaned us their car for us to drive around the island. What a huge blessing that was! 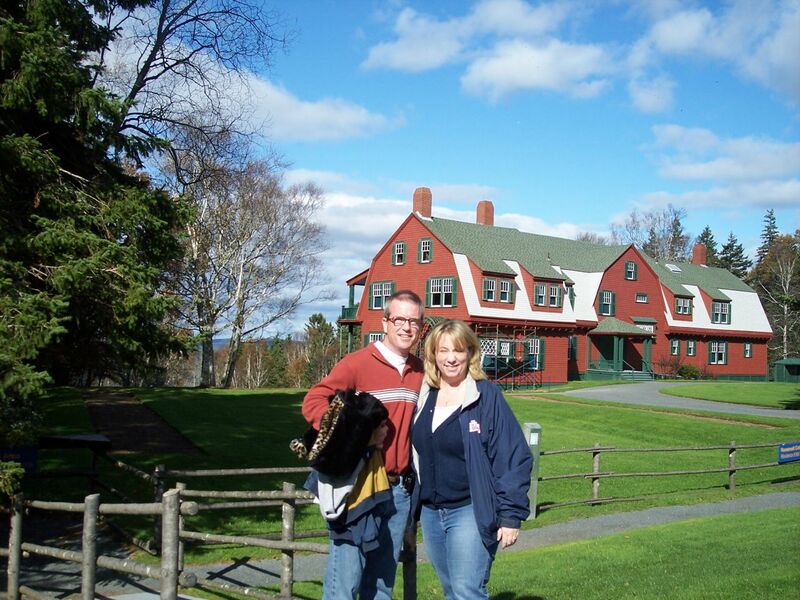 We started our day by going to the Roosevelt Campobello International Park. This is the only park in the world to lie entirely in one country and be governed by two countries. Canada and the United States share the responsibility for running the park. As a child, Franklin Delano Roosevelt came to Campobello Island for the summer and this practice continued into adulthood and after his marriage to Eleanor. Roosevelt called Campobello his "beloved island." Their annual visits continued until 1921 when Roosevelt was stricken with polio. His last visit to the island was as President in 1936. Eleanor continued to visit the island, even after their 'cottage' (really it's mansion-sized) home was sold, up until the year of her death in 1962. The cottage has 34 rooms, 18 of which are bedrooms and 6 are bathrooms. It overlooks the water where Roosevelt sailed and fished as a child. We didn't get to go in the cottage because it had closed for the season just last week. We did walk down to the water, though. After the Roosevelt park, we drove to the nearby Mulholland Lighthouse. This small lighthouse sits near the FDR bridge that spans "the narrows" between the US and Canada. It isn't open for tours but you can explore the grounds. 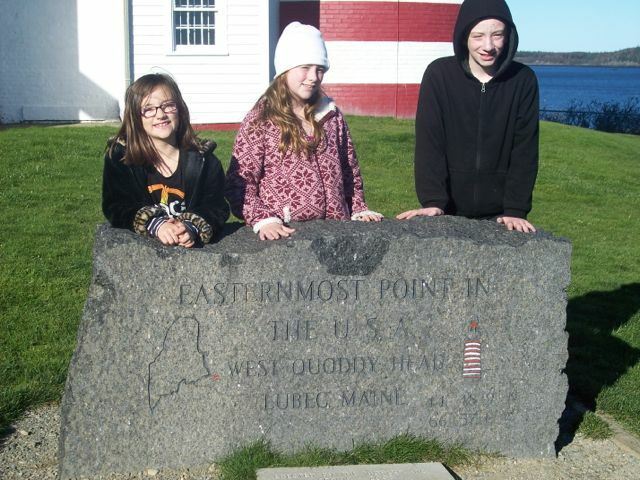 Next we went to the East Quoddy Lighthouse. 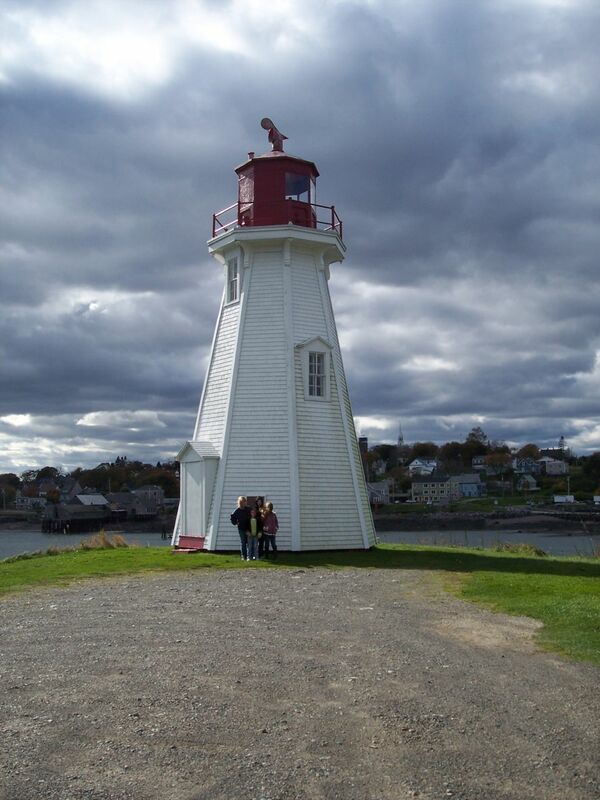 This is the most photographed lighthouse in New Brunswick. The interesting part about this lighthouse is that it is only accessible at low tide. 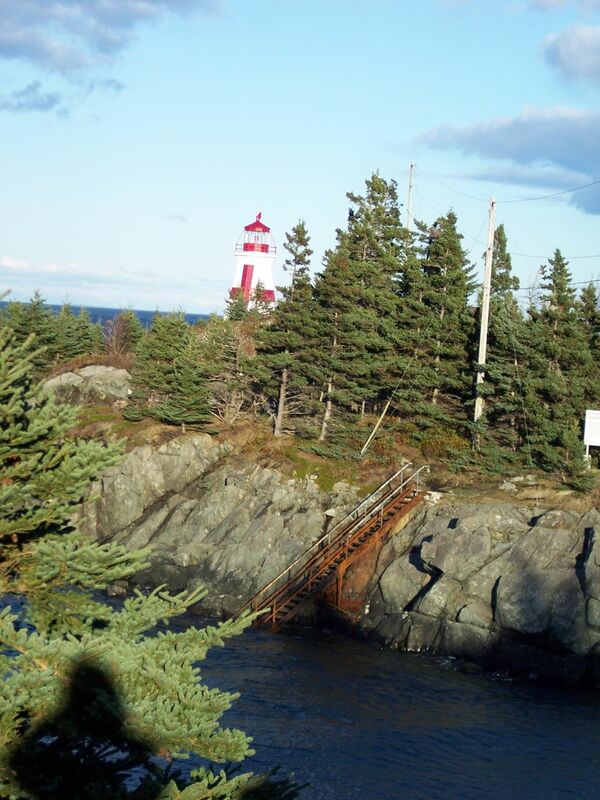 During the rapidly rising high tides of Campobello, the staircase that allows access to the lighthouse is submerged in water. 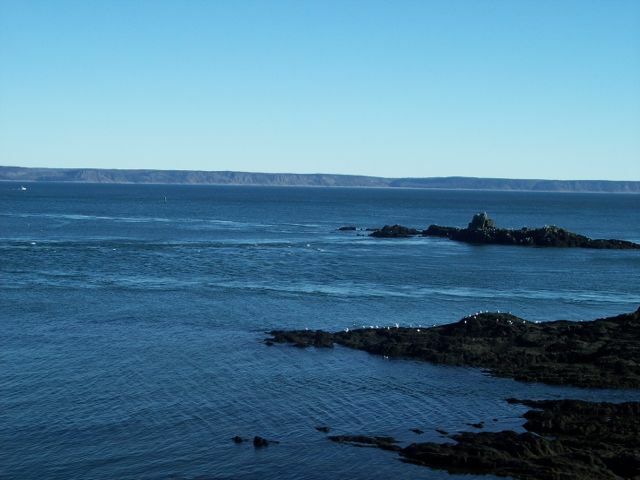 The Bay of Fundy is known for its high variances in tides, in some places being up to a fifty-foot difference between high and low tides. Since we made the trip during high tide, we didn't make it over to the lighthouse, but we did get some interesting pictures of the staircases! 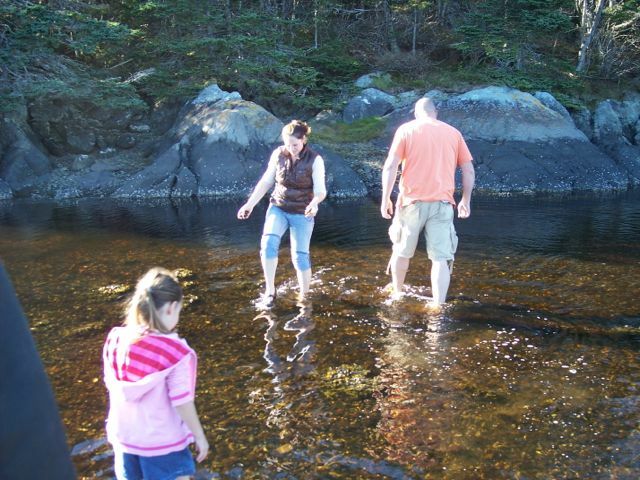 Next we traveled over to Herring Cove Beach in Herring Cove Provincial Park. This park has a campground, golf course, and playground in addition to the mile-long stretch of pebbled beach. 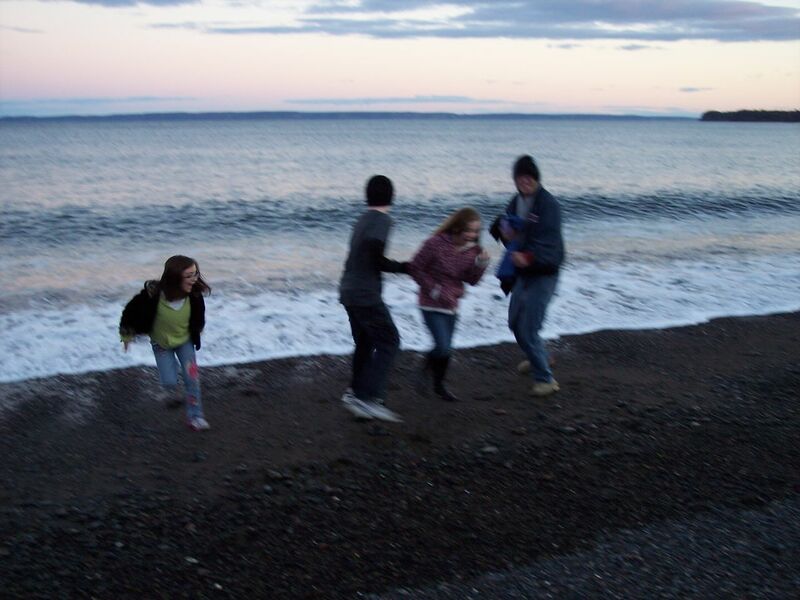 We watched the sun go down here, searched for neat pebbles and shells, and the kids let the incoming tide chase them back from the water's edge. The sound of the crashing waves brought to me that peaceful feeling like only the beach can. We headed back to the Calder's home, to return the vehicle, and they gave us hot chocolate and convinced us to stay another day. So tomorrow will be another adventure/exploring day here on Campobello! More pictures in the Photo Gallery! 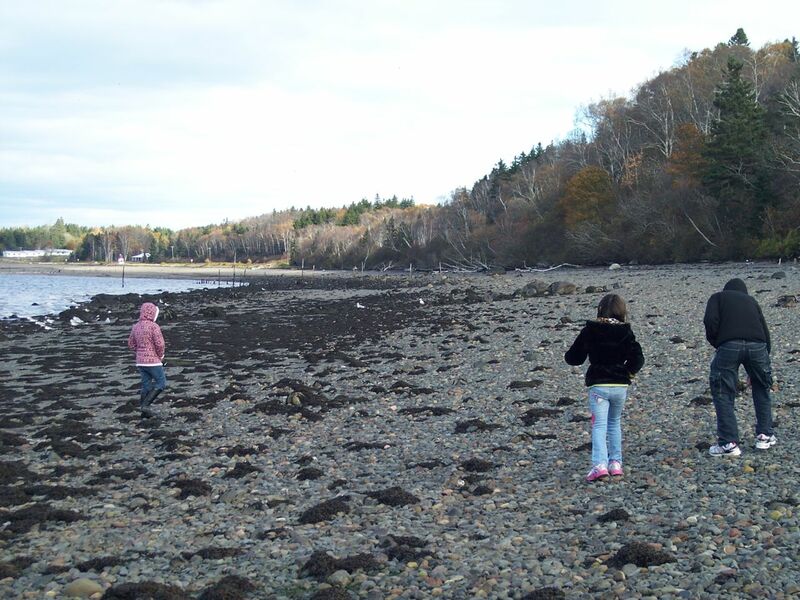 Campobello is a beautiful place so take a look! Today we went to church at The Rock Church in Scarborough, Maine. Great service with a great message - putting up guardrails in your life. Then we went to fill up on water, empty the tanks, and buy some groceries. We got a nice surprise from a friend of ours yesterday. 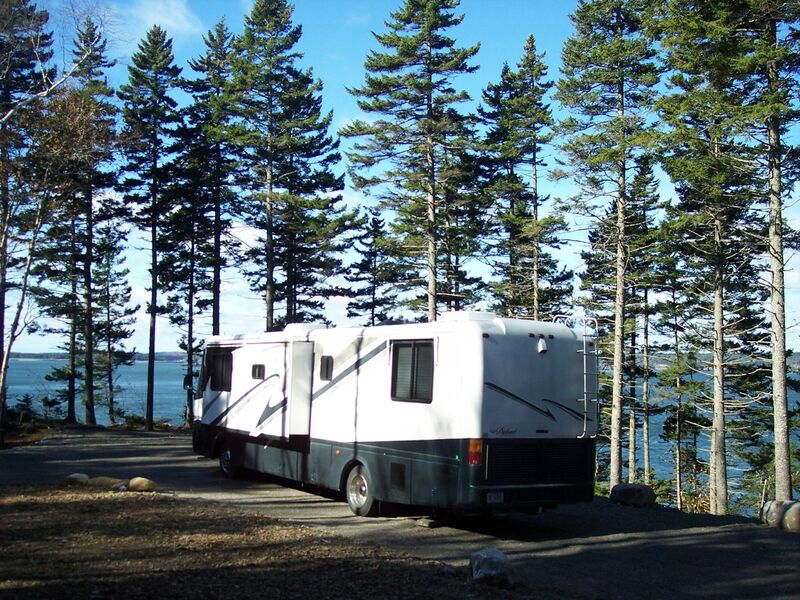 He emailed us to let us know he has property on Campobello Island, in New Brunswick, Canada, and offered to let us stay there in the RV. He actually also has an RV, so the property is perfect for us. So today, after doing all of our necessary things, we headed out to Campobello Island. Tomorrow, waking up on the shore should be an awesome experience! The Maine capitol was on the agenda for today, along with the State Museum. The Maine capitol reminded us a lot of the Tennessee capitol building in Nashville. We did a self-guided tour since we had missed the morning guided tours. The rotunda was accessible on one floor, along with the viewing galleries for the House and Senate. The House Chamber had a meeting going on (not a session) as well as some renovations, so we didn't get to go in there. 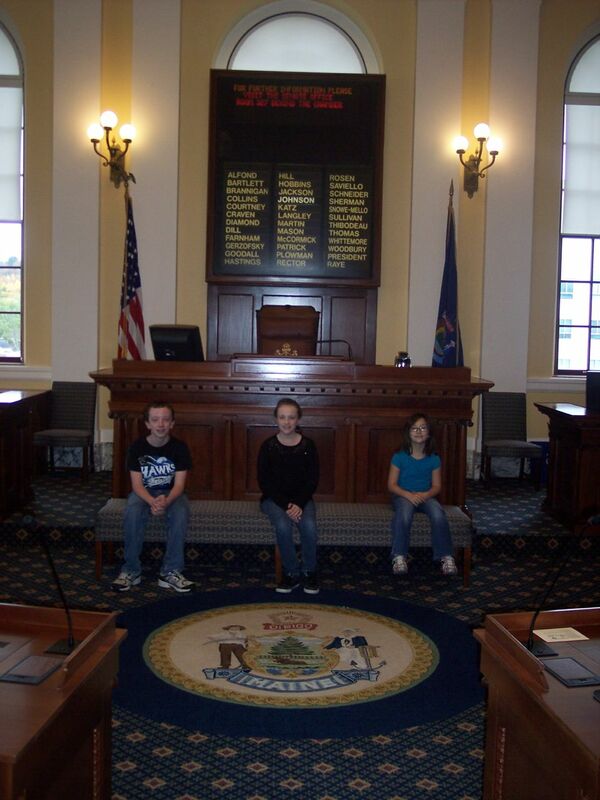 The Senate Chamber was open though, so we got some good pictures in there. After our capitol tour, we crossed the street to the State Museum. 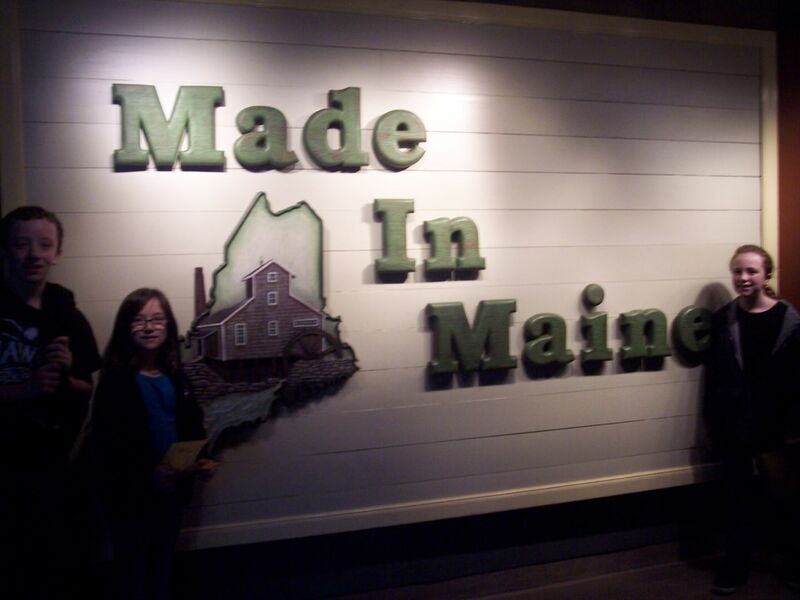 This museum traces the history of Maine and its industries and people. There was a part of a ship, the St. Mary, that shipwrecked on its maiden voyage near the southern tip of South America. It laid there until 1978 when the museum helped return it to Maine and place it in the museum. There were also trains and an exhibit on ice pickers. The bottom levels had a "Made in Maine" section, which detailed all the things that people in Maine made and used throughout the state's history. There were several items that Jim and I both had growing up. 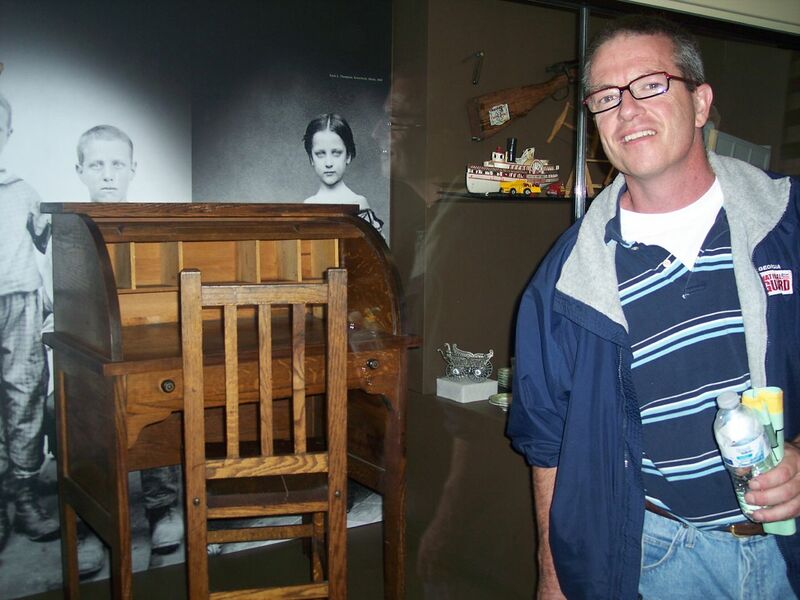 For instance, there was a desk that Jim had as a kid. There was another whole section on Malaga Island, which lies on the coast of Maine. This island was a fishing community and fairly self-sufficient. In the early 1900s, those on the mainland thought that these people were poor or criminals because of their genetic makeup. It was a largely mixed-race population, as well. So, to prevent the population from growing, the Maine government forced everyone off the island in 1912. It is a sad story, and if you'd like to read more, check out this web site. We enjoyed both places we visited today! More pictures in the Photo Gallery.